People who are just learning about TTL frequently ask about our role in the lives of children after they leave the safehome. All of our safehome babies become outreach clients when they are reunified with their families, meaning that TTL still supports them with monthly food packages and monitors them to make sure they are continuing to make strides in their growth and development. When we are confident that these children have the care and resources to continue progressing without TTL's assistance, they are "graduated" from these services. However, even when they no longer require our check-ups and nutritional support, TTL does its best to ensure that the health needs of these children are met. 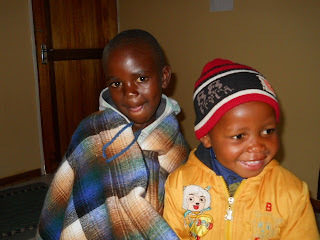 To illustrate TTL's efforts to be an ongoing source of support to the children we reach, below are Leboneng and Nako. Leboneng, now 6 years old, was in the safehome from 2006-2007. Nako, 3, stayed with us in 2009 and 2010. These boys are no longer part of our outreach program, but they stop by TTL once a month to get the taxi fair TTL gives them to come to Mokhotlong Hospital to pick up their ARVs. The boys live in the same area and arrive together with their caregivers, who cannot afford the cost of transportation. How much money does TTL spend on making sure Leboneng and Nako get these important drugs every month? Just over $2. The adage "a little goes a long way" comes to mind. Although the availability of ARVs in Lesotho has vastly improved in the past couple of years, access to the clinics and hospitals that provide them can still be a challenge to those living in rural villages. I can't say for certain what would happen if TTL did not provide this assistance to Leboneng and Nako, but it is a real possibility that they would not get their ARVs, depriving them of the chance to live healthy lives in spite of HIV. Ah, Nako!! He looks great!